Nothing kills an e-commerce conversion rate more than a hesitant customer. Giving people the option to return again later is like saying “go ahead, shop around first.” No one wants to give a customer that option, especially at Christmas when competition of sales is at its peak. There is one tactic guaranteed to keep people on your site for longer: urgency. So, how do you improve conversion rate through increased urgency? You don’t want to seem pushy or demand sales from customers. In this article we will discuss the ways to increase conversion rate without being so obvious. When it comes to Christmas, managing expectations is so important. There’s nothing worse than a customer that orders online hoping to receive their parcel in time for Christmas Day, only to find it arrives the following week – oops. “Order now for delivery in time for Christmas” is the message you need to make clear to customers. Post it on social media, create a banner for your website and send out targeted email marketing campaigns. There should be no reason for them to return later. Your customers are here and should purchase now to avoid disappointment later. Cart abandonment is huge problem with online shoppers. Almost 70% of all online shoppers abandon their shopping cart. In other words, 7 out of 10 potential customers will not complete their order with you. To incentivise them to follow up on their purchase, give them a gentle nudge in the direction of your website. Set up automated messaging to abandoned cart customers to prompt a last-minute sale. Better still? Offer them a discounted price if they purchase before Christmas. Target these customers with a remarketing campaign that follows them around the internet with the offer of discounted products. You’ll increase brand awareness as well as drive more sales to that particular product or service. Though people are used to shopping online, it can be a shock when faced with the additional cost of shipping. They probably still have a list of people yet to buy for this Christmas. 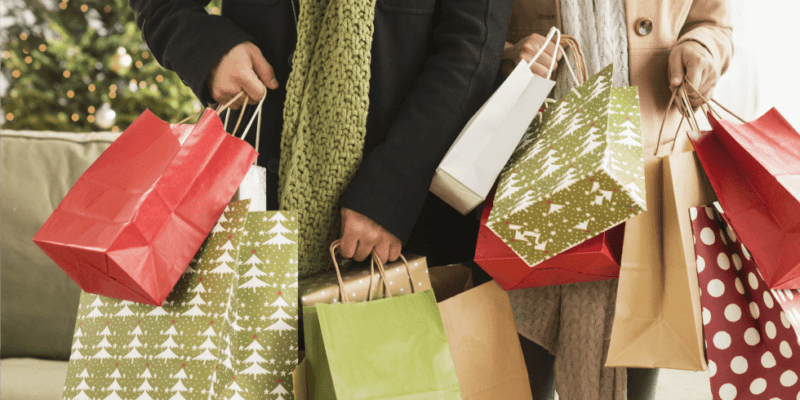 Giving the gift of free shipping is going to make their lives much easier – plus encourage conversions for your e-commerce business. Everyone loves free stuff. Offer your buyers a discount code or coupon at the checkout. People’s fear of missing out on something great will increase their urgency to repurchase. Plus, with all those presents they must buy in time for Christmas, there may even be a second purchase to be made. There are countless conversion tactics that not only get your customers through the door, but encourage them to hit that buy it now button. Think about revisiting your sales and marketing funnel as remarketing is a clear winner when it comes to repeat custom. Return to our 12 days of Christmas marketing tips for even more impactful marketing strategies this festive period.